Dr Les Walkling is a renowned artist, educator and imaging consultant. He was the Program Director of Media Arts (1993 – 2005) and a Senior Research Fellow in the School of Art (2006-2010) at RMIT University. In 2012, he was named a Fellow of the Australian Institute of Professional Photography. Les serves on museum boards/committees of management and cultural and technical advisory groups. His own work is widely exhibited and represented in many public collections including the Metropolitan Museum of Art (USA), the National Gallery of Victoria, the Art Gallery of NSW, and the National Gallery of Australia. Les has been teaching specialised workshops since 1977. In recent years his practice has expanded to include major collaborative projects with other artists including Peter Kennedy, Polixeni Papapetrou, Siri Hayes, Tony Hewitt, Peter Eastway, Christian Fletcher, and Bill Henson. I caught up with Les at his Melbourne studio on a Spring afternoon a week after the opening of “Journeys into the Wild”, an exhibition of Peter Dombrovskis’ photography at the National Library of Australia. Les was about to press check the third print run of the exhibition’s companion book. Les was kind enough to spend an hour describing his role in preparing images for the exhibition and book. In the following interview, Les explains the lengthy process of preparing images, discusses the challenges of printing the images of a photographer who is no longer with us and reflects on how a refreshed portfolio of Peter Dombrovskis’ photographs might encourage photographers to imagine a purpose beyond the “glory phase” of image making. Earlier this week I visited the National Library to see the exhibition. It’s fabulous. Would you like to share a bit of the “back story” on how it all came together? I was approached early in 2014 by Sam Cooper, head of digitisation and photography at the National Library of Australia in Canberra (NLA). The Dombrovskis archive is a personal passion for Sam, who managed the precise and ISO compliant scanning of Peter’s original transparencies. Liz Dombrovskis, Peter’s widow, was also very involved. Indeed the whole project would not have been possible if Liz had not so generously bequeathed Peter’s archive of over 3000 transparencies to the National Library, and on numerous occasions, Liz provided us with detailed guidance and advice. Peter’s 5x4in and 6x6cm transparencies are now safely housed in the NLA’s cold storage facility, while their digitised ‘archival scans’ are readily accessible on the NLA’s Trove website. 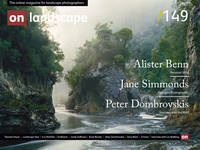 Initially, I was contracted as a consultant working with Susan Hall, Head of NLA Publishing and her team to undertake the file preparation and CMYK separations for their publication, Journeys into the Wild: The Photography of Peter Dombrovskis. I then worked with Matthew Jones, Curator of Exhibitions at the NLA, and his team on the exhibition file preparation and printing. Matthew Jones and I visited Liz on separate occasions at her Fern Tree home on the slopes of Mt. Wellington in Hobart, and our conversations were always buzzing around my preparation of Peter's images. Liz had also loaned me an incredible collection of books her publishing company, West Wind Press, had produced over the decades. My first six months were devoted to the restoration and preparation of 183 publication ready files. The next four months were devoted to the file preparation and printing of 80 exhibition prints. Across both projects, I worked on 223 of Peter's images, with 215 of them ending up published and/or exhibited.